It was recently my birthday and one of the gifts I received was Google’s ChromeCast, which I’d had my eye on since the came out and I’ve not been disappointed since I started using it. Of course it’s aim at those who are invested in Googles software in it’s many forms. 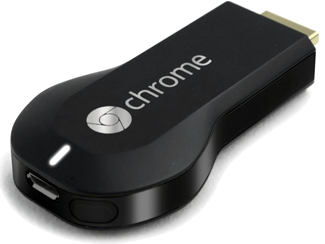 Once slotted into the HDMI of my TV it was much easier to watch Youtube, Google Music, iPlayer or Netflix via my phone or tablet. These apps are enhanced and instantly detect the cast functionality and enables a 1-click-button to broadcast. On the PC the result is the same and I have found it easy to broadcast from my computer to the TV connected to the device. With access to my PC and a Chrome Browser extension I can broadcast a tab to the TV including audio. Tab broadcast is very nice as I use Amazon Cloud Player and can stream this using the enhanced Audio Quality setting. Certainly a nice piece of kit if you are wanting to enhance your streaming capabilities.